Would You Run a Litter-Free Race? This morning I ran the Wicked Halloween 10K in Plymouth, one of the Kona series of races that I volunteer for as a pacer. It’s a nice change to enjoy being part of a race without busting a$$ trying for a PR. And at the end you’re encouraging people to pass you. How fun is that? Despite a chilly start, I enjoyed the event. 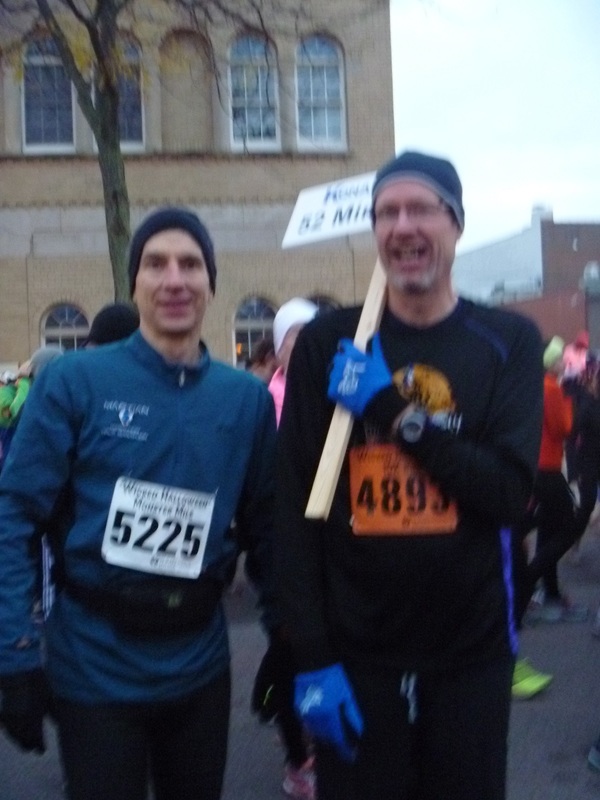 My regular pace partner, Mike, and I breezed through our 52-minute assignment, and everyone there seemed to have a good time. A typical well-run local race, and I wouldn’t have anything to contribute by way of improvement – except for the cups scattered along the roadside at the water stations. Races generate large amount of trash from cups and disposable water bottles. 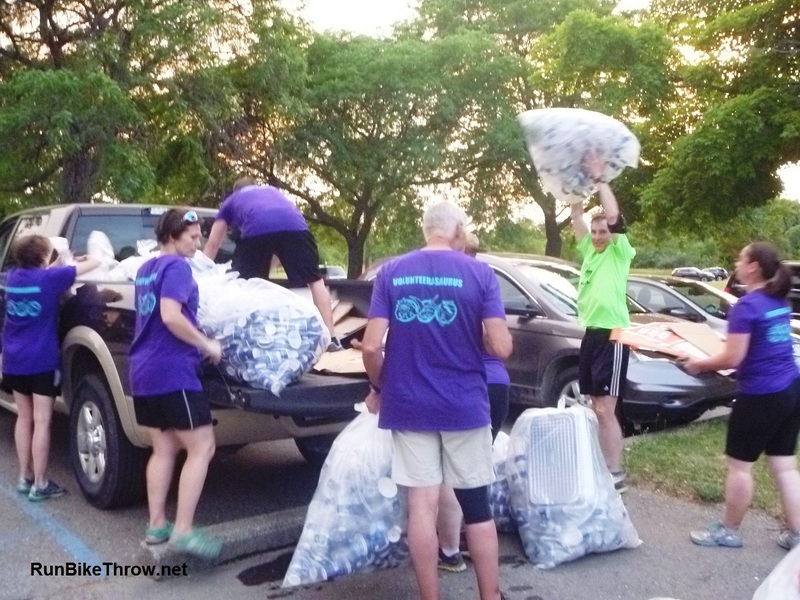 Most is handled through numerous trash cans and boxes throughout the area, and runners by and large are good at putting trash where it belongs, with one exception. On the race course itself, runners typically grab offered cups of water and Gatorade without stopping, gulp them down on the run, and then throw the cups on the road, or off to the side. This is standard behavior, and if not ideal, is accepted and is dealt with through lots of volunteers. During the Chicago Marathon I even saw people standing at the aid stations with brooms, sweeping the trash off the road whenever they could. But I still had to step carefully at many stations to avoid slipping on cups, sponges, and other debris that 35,000 runners discard over the course of 26.2 miles. Nearing [the finish line], Jean-Marc needed to dispose of one of those energy gel packs. Approaching one of the race volunteers, he flashed a winning smile and pitched the plastic tube to the side of the road. [A] race official, standing nearby and seeing the tail end of the exchange, held out a yellow card. 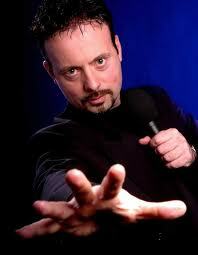 Jean-Marc was sanctioned for littering! This is the first time I’ve heard about penalizing runners for littering during a race. But a little online research turned up a few efforts to minimize and/or eliminate race litter. 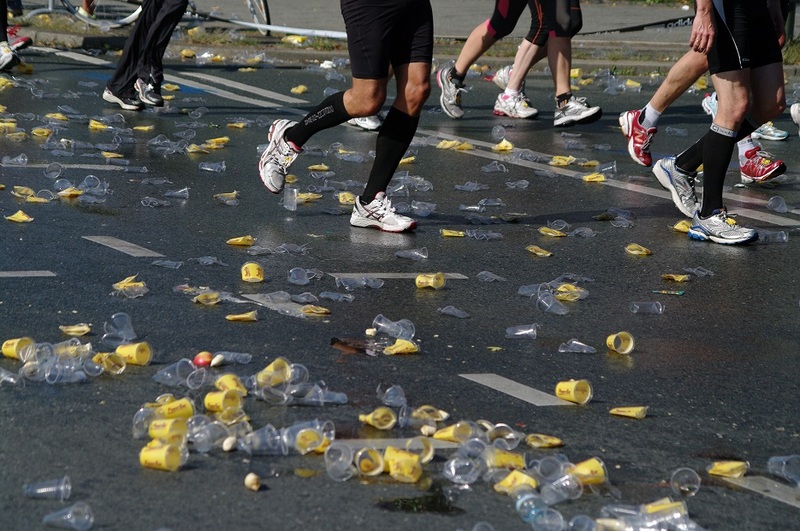 For example, check out this article from the Mother Nature Network that describes what some marathons are doing to address the amount of waste associated with their events. And here is a video of a zero-trash water station at the Circular Logic Marathon, where every runner uses a refillable water bottle. Have any readers been part of a “no-littering” race? What do you think of the idea? Would you support it? Please try the poll below, and/or comment – I’d like to know your thoughts. P.S. The next race in the Kona series is the Chocolate Run on November 17. Hot chocolate, scones, chocolate chip cookies and premium Chocolate Fountain Fondues along with music in historic downtown Plymouth! P.P.S. In addition to her posts, Kristin takes amazing photographs of French life and the other places in Europe she visits. Consider signing up for her email newsletter.